When combined with the Foamroof Spray Foam treatment, a Velux window can transforms a dark and dingy attic into a light, airy and useful space. We like Velux windows so much that we want everyone to have one so we regularly run special offers. Keep an eye out on our website for a bargain. Foamroof are registered 5 star Velux Installation Partners. This means we are expected to work to highest standards and get special support directly from Velux. In specific areas, such as watertightness, VELUX has introduced its own standards that are stricter than international standards. 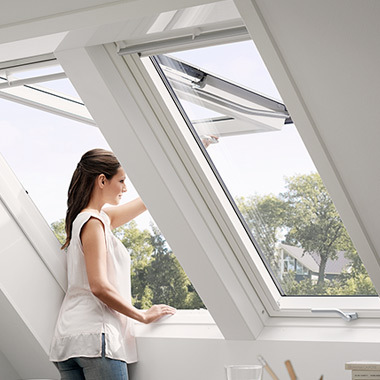 In the countries where VELUX was first established, it is still possible to find working windows that were installed more than 40 years ago – the best possible proof of durability. VELUX Roof Windows give an uninterrupted view when fully open, creating extra headroom and a feeling of being outside. Combine them together to give dramatic visual impact and flood your loft with daylight. Foamroof are expert installers and can install the windows in panoramic sets as illustrated. 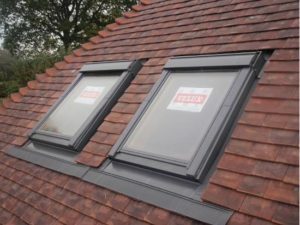 We ensure the windows are properly well using the correct flashing kits for either slate or tile so as to guarantee a long, leak free life. Our Center Pivot roof windows are simple to open and close, with operation assisted by powerful yet gentle springs. Even with furniture beneath the access is easy. The window swivels in its frame for easy access and cleaning purposes. OperationTop-Hung Roof Windows open outwards to provide extra headroom and expansive views. PitchCan be installed in roofs with pitches from 15o-55o. For roof pitches from 55o-75oplease specify special springs when ordering. 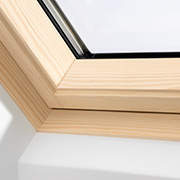 The Velux Roof Windows we install are 780mm x 980mm are the natural pine finish. As they are center pivot we can typically install them at a lower height so you can enjoy your view or surroundings. We carry a stock of these windows, if you have a specific requirement, please let us know. Pine finish roof windows are coated with a water based colourless lacquer that protects the wood against dirt and moisture.